Strategy: Using a percutaneous technique (no suture or scar), the body of the collapsed vertebral disc can be augmented with a new type of silicone material (adapted to match the natural elasticity of natural bone structure). Kyphoplasty reduces the pain from a vertebral compression fracture immediately following surgery. What is Kyphoplasty as a treatment for Vertrebral Compression Fracture? Kyphoplasty is a way of repairing a damaged spine, by use of a minimally invasive surgical procedure. It was designed to treat spinal fractures (separation and weakness of the bone material in the vertebral body). These fractures are often caused by osteoporosis. Vertebroplasty or Kyphoplasty is a procedure with a long medical history. For decades Kyphoplasty has been performed as open spine surgery, in order to increase the volume of the fractured vertebrae and as pain relief. However, since 1984 this procedure has been performed as a minimally invasive procedure: the percutaneous vertebroplasty has become a standard procedure following osteoporotic cerebral fracture. Transcutaneous Vertebroplasty is the surgical repair of vertebral fracture with bone cement or a modern silicone material without restoring the height of the vertebral bone. The site of the fracture is treated and secured with an internal cast. Transcutaneous Kyphoplasty is almost the same procedure, however before applying the cast, the height of the vertebral body is restored. This is achieved by inflating a balloon to create a cavity at the fracture site, this cavity is then filled with bone cement. Elastoplasty describes the use of a more elastic silicone based filling agent for transcutaneous kyphoplastic surgery, instead of the traditional brittle bone cement (PMMA). In healthy patients a vertebral fracture can occure as a rare consequence of a serious accident. 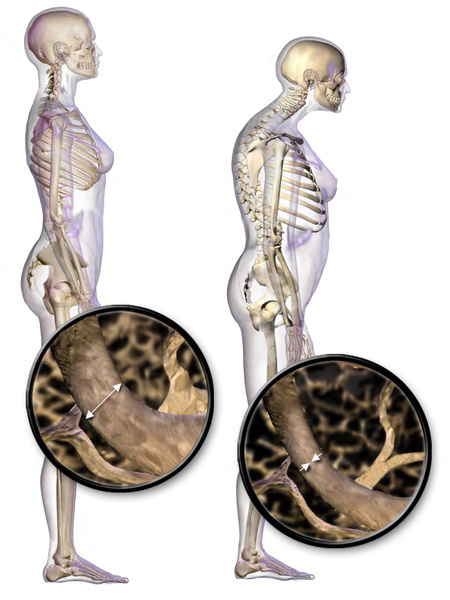 In patients with osteoporosis the vertebral fracture can result from daily life. A situation as trivial as a stumble on stairs while carrying a bag, sneezing or coughing can result in vertebral fracture. The result of vertebral fracture is immediately painful and irritating. Any bone fracture can lead to an edema (a build up of fluid causing a painful internal swelling). The pain is always felt close to the site of the fracture, commonly near the waistline in the lumbar spine. 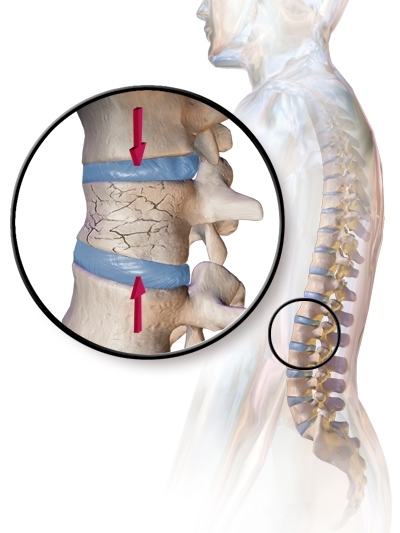 It is in this area that the vertebral bodies suffer the highest pressure and crack most often. The pain worsens in a sitting or standing position. Patients experience pain relief by lying down. Mobility and therefore quality of life is naturally reduced by a vertebral compression fracture, as the patient will have a tendency to remain in a resting position. Prolonged instability of a vertebral bone, has the potential to cause the fracturing of vertebral bones as ongoing process. The pain resulting from vertebral fracture will continue until the bone fracture is stabilised, either by healing in it's new position within a couple of months, or by being treated with either kyphoplasty or vertebroplasty. As the vertebral spine mechanically supports the central nervous system, the loss of height resulting from the collapse of a vertebral body will put painful pressure on particular areas of the spinal cord. This has the potential to damage spinal cord and nerve roots. Numbness, palsy, loss of reflexes and muscle strength after vertebral fracture, require particularly careful clinical supervision. A detailed MRI investigation after the detection of these neurological symptoms, has the potential to ascertain the exact location and nature of neurological trauma resulting from vertebral bone fracture. The spine, as a central axis of the skeleton and nervous system (spinal cord), is affected by loss of height and stability. The spine loses its shape and the volume of the lungs is decreased. Depth of breathing and respiratory function is impaired. This will ultimately lead to deterioration of the metabolism and vitality of the patient. Depending on the location of the fracture, organ systems can be affected by the vertebral fracture through deteriorated nerve function. The reduced height of the spine as the central axis of the upper body, increases pressure on the digestive organs inside the body cavity. Vertebral fracture can permanently change the shape of the patient, resulting in a "hunch" or humpback. The ability of the vertebral spine to carry weight will decrease. The elastic properties of the spine will be altered. The patient will have a tendency to look down at the floor, as deformity of the spine after vertebral fracture makes it increasingly difficult to raise the head. The ability to deal with daily life and general orientation will suffer as a result. Most cases of vertebral compression fracture heal naturally (8-12 weeks after the vertebral compression fracture occurs). A combination of rest and pain medication helps the patients through the painful episode. In order to support the healing of the bone fracture, the spine may be immobilised with a back brace. However, bracing the spine and the continuous bed rest may lead to the significant weakening of muscles and a general deterioration of the patient. It needs to be recommended with care, especially in the elderly, who may already have a weakened general condition. Bed rest and spinal braces may help in avoiding further pain after a vertebral compression fracture, but inactivity accelerates bone loss and weakens the surrounding muscles. Building bone mass through medication, is a frequently recommended treatment strategy. 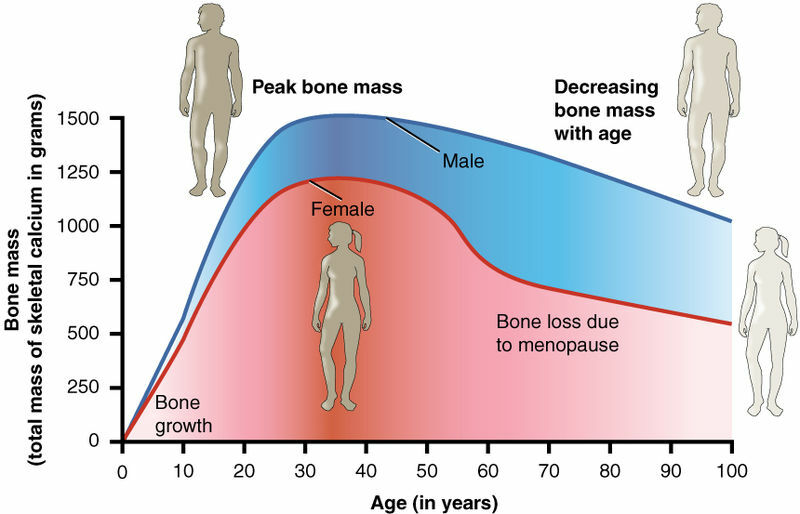 This will require a long term view on the developement of osteporosis. Exercise of all kinds has been proven effective in stopping the progression of osteoporosis. 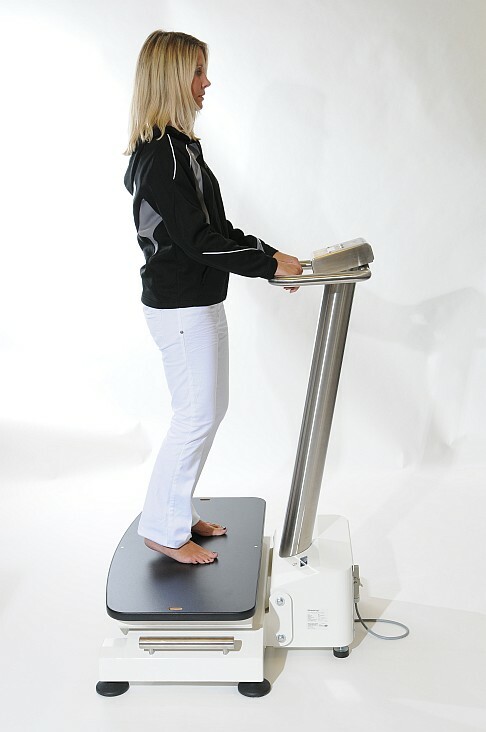 Biomechanical stimulation treatment using a vibration plate is part of the physiotherapy regime used at the orthopaedic Gelenk-Klinik. It provides impulses for the bones and muscles, thereby improving calcium metabolism in bones. Vertebral compression fracture is one of the most misdiagnosed conditions: only 30% of all vertebral fractures as a consequence of osteoporosis are diagnosed. In many other cases, the sudden onset of back pain is attributed to nerve compression, muscle tension and other conditions. Osteoporotic fracture of the spine is much more common than osteoporotic fracture of wrists and hips. Osteoporosis (as a silent disease that progresses without symptoms), the vertebral fracture is for many patients, the first sign of a weakened bone structure. During the clinical investigation the spine specialist will inspect the patient and look for signs of a severely rounded upper body (visual inspection for straightness and the alignment of the spine). By putting manual pressure on different parts of the upper body, the specilist will find out if the pain results from pinched nerves, strained muscles or other kinds of injury to muscles or degeneration of the bones. A neurological examination will follow to check for additional injury to nerves. This includes testing reflexes and strength. Finally the diagnosis of a vertebral compression fracture is confirmed by an X-ray image The presence and location of narrowed vertebrae can be clearly seen from a side on view. Other spinal problems such as spinal disc degeneration, scoliosis, spondylisthesis can also be idenitfied via X-ray. The MRI investigation of a vertebral compression fracture will provide information about the time line. The amount of liquid (edema) at the site of the fracture gives an idea of how recently the fracture occurred and how far it has healed in it's new position already. A decision about the aplicability of kyphoplasty depends on this information: only fresh fractures (no older that 8 weeks are treatable by kyphoplasty). A bone Density Scan (or DEXA-Scan) can help to assess the overall bone structure and the degree of osteoprosis. The condition that is diagnosed by the DEXA-bone scan is called osteopenia: thinning of the bones. 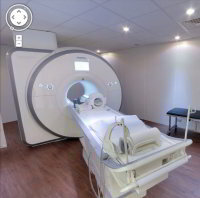 The DEXA scan can measure the degree of mineralisation remaining in the bone structure. it is a clear indicator of the future risk of additional vertebral compression fractures. Who qualifies for treatment of an osteoporotic vertebral fracture with Kyphoplasty? For many patients the change in body shape and height resulting from a vertebral compression fracture is not acceptable. For other patients the activity modification and bed rest in combination with conservative therapy seems to increase the underlying condition of bone loss. Patients who would rather not suffer the pain associated with osteoporotic compression fracture decide in favour of kyphoplasty: this not only augments the height of the compression fracture, but also brings immediate pain relief after surgery. Patients usually go home after 2 nights, but they are mobile and pain free immediately after the procedure. According to Dr Frank Haberstroh, orthopaedic spine specialist, who has more than 10 years experience with kyphoplasty, this procedure is one of the most immediately gratifying spinal procedures. It brings immediate pain relief after compression fracture and preserves the natural shape of the spine, without the risks associated with major spine surgery. Kyphoplasty or Vertebroplasty is performed while the patient is lying face down. Insertion of a tube (working channel) under X-ray guidance into the fractured vertebral bone. A thin tube with an inflatable balloon (called balloon tamp) is guided into the damaged vertebral bone. Balloon is inflated until the original height of the fractured vertebrae is restored. After a sufficient cavity is created the balloon is deflated and removed. Bone cement or silicone material injected onto the cavity. This bone cement hardens within 10 minutes. It secures the fractured bone particles, effectively acting as an internal cast. Surgical procedure ELASTOPLASTY is performed the same way as traditional kyphoplasty. However, the stabilizing agent is not traditional bone cement (Poly-Methyl-Acrylate or PMMA), but an elastic silicone material. 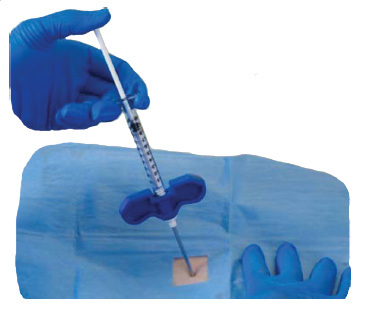 What are the advanages of the silicone material in kyphoplasty? Fracture and collapse of porous vertebrae is one of the most common consequences of osteoporosis. The vertebral bodies lose this height. The resulting vertebral fracture is very painful. The vertebral body can be re- erected and filled. Until recently the gold standard in the treatment of vertebral fractures was filling with bone cement (PMMA). This material is durable, but very hard and perfectly brittle and inelastic. Secondary fractures of adjacent vertebrae after kyphoplasty with bone cement (PMMA) is one of the most severe side effects of kyphoplasty: 20-25 % of all patients with kyphoplasty on the basis with bone cement will experience a secondary vertebral fracture in the area adjacent to the treated area. In response to this problem, an alternative elastic silicon-based filler material has been developed in the United States and tested since 2009. The newly developed elastic silicone filler improves the reliability of the recovery after vertebral fracture. It significantly reduces the rate of secondary vertebral fractures. For a definitive statement that operated in Germany case numbers are still too low. 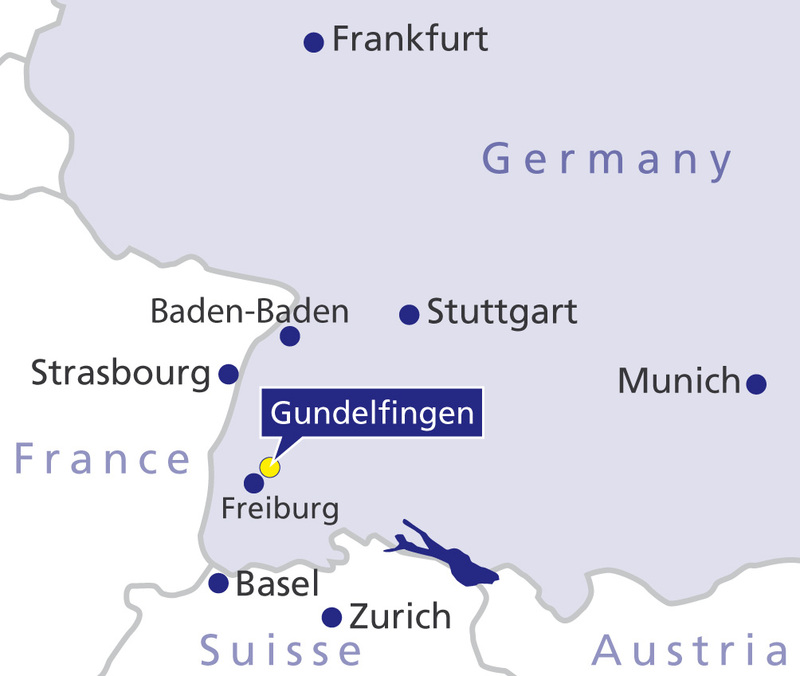 The patients in the Gelenk-Klinik hospital treated with this method have very promising outcomes and no subsequent compression fractures so far. The application of elastoplasty in England and Spain since 2009 has so far shown very good clinical results: Approximately 90 % of patients are pain-free after Elastoplasty immediately after surgery. The elastic material provides a better static distribution of weight and impact within the osteoporotic verbral bone tissue. Elastic properties of bone tissue stay intact and are not changed by the use of a more elastic silicone material. The main goal of transcutaneous kyphoplastic surgery after spinal fracture - to eliminate the severe pain of the patients fast - is achieved in a more reliable way with the silicone based elastoplasty. When will your spine surgeon suggest an alternative procedure after spinal compression fracture? When to look for alternative treatments? Please contact us for a thorough investigation and to discuss treatment alternatives. Sometimes there is too much mobility between the vertebral bones. This situation is called Spondylolisthesis Fusion surgery is used to correct this is hypermobility. Safety: the surgical group had no increase in adverse events in comparison to the non surgical group. There were two events of leaking bone cement from the broken vertebrae, this supports the use of silicone as a safer alternative material (as favoured by the Gelenk-Klinik). Kyphoplasty is a highly specialised spine procedure that provides very fast relief of back pain and quickly restores mobility. Kyphoplasty also has the potential to restore body height, helps to straighten the spine and reduces deformity resulting from osteoporotic compression fracture. According to clinical studies, patients with vertebral compression fracture experience significant pain relief with kyphoplasty, in comparison to patients treated with nonsurgical options (pain medication, bed rest and braces). Successful Kyphoplasty usually provides almost immediate pain relief (the day following surgery). After Kyphoplasty no particular rehabilitation is required. The patients can continue with their daily lives without braces or bed rest. It is recommended that the patients continue outpatient physiotherapy to strengthen the back and address underlying osteoprosis.